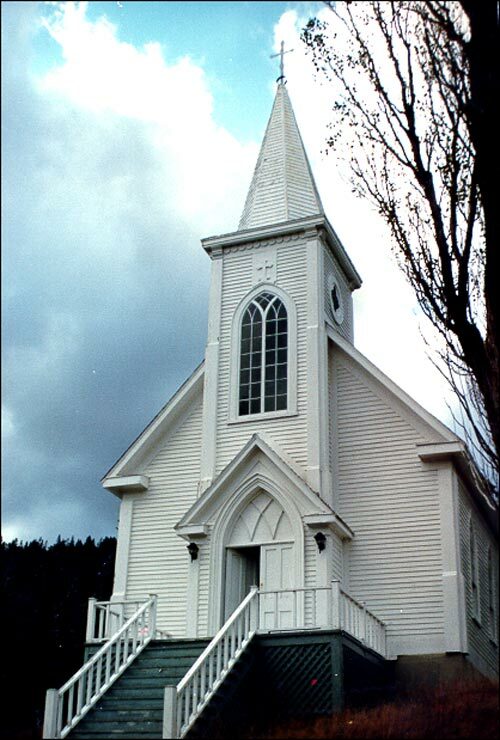 For nearly 110 years, St. Patrick's church served the spiritual needs of the people of Bonne Bay. It was built in 1875 at Bailey's Point by Joseph Breau of Pictou, Nova Scotia, and Peter Jackman of Bell Island, Newfoundland. St. Patrick's Church is a good example of the Gothic Revival style of architecture in an outport setting. In the late 1880s there was a shift in population and a change in the parish centre. St. Patrick's was moved, in sections, nearly two miles over the ice floes from Bailey's Cove to Woody Point where it currently stands. The church was forced to close in 1984 because of its deterioration. St. Patrick's was built under the direction of Rev. Thomas Sears, who was the first Prefect Apostolic of St. George's from 1868 to 1885. Also view St. Patrick's Roman Catholic Church Registered Heritage Structure on the Heritage Foundation of Newfoundland and Labrador web site. The Newfoundland and Labrador Heritage Web Site has on its site only a portion of the registered heritage structures in Newfoundland and Labrador. To view a complete list or search for a particular structure visit the Heritage Foundation's Property Search page.